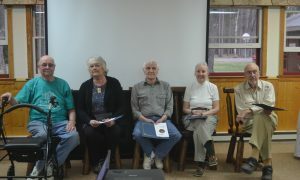 On May 16, 2018 the Manitowish Waters Historical Society (MWHS) proudly recognized 7 community member as Leaders of Historical Preservation. Our celebration of "historical pioneers" marks the first MWHS recognition of what will become an annual event. The inaugural Leaders of Historic Preservation each contributed significantly to preservation of vital records, images, narratives, maps, histories, artifacts and stories that are at the foundation of our community's identity. Though the recipients may have pursued historic preservation differently, each are vital to our ongoing documentation of our town's history. With great honor we post names, pictures and stories of Manitowish Waters Leaders of Historic Preservation! Homer grew up in Manitowish Waters so he has a deep rooted love for this area, its history and people. He, along with today’s group of honorees, recognized the importance of capturing critical resources and family stories before the opportunity was lost. One of his major contributions in that regard was recording numerous interviews of key community members—on cassette tape. This work truly captures our heritage, giving us a personal view of our rich history and providing a strong foundation for our Historical Society. Homer was also involved, along with Jim Robinson, in documenting Paul Brenner’s story and historical perspective of this area and the logging days, resulting in a quality historical document. Thank you Homer for your dedication and leadership in preserving our local history. Elizabeth worked closely with Homer and Jim on initial historical projects: researching, gathering and documenting information. A major, and time consuming , contribution of hers was transcribing all the audio interviews Homer and Jim had recorded. Today’s technology was not yet available so she worked from cassette tapes requiring many stops and rewinds to get the transcription correct. Truly a very arduous and challenging undertaking. She was also instrumental in arranging presentations to share Manitowish Water’s history and generate excitement for preserving it. This was at a time prior to today’s “hunger” and interest for local history. So to Elizabeth, thank you for your dedication and hard work and for being a pioneer of historic preservation in our community. Jim is all about the visuals. He recorded numerous videotaped interviews of local residents recalling their stories and memories of our community. He also documented sites around town with photographs. A significant undertaking of his was putting together a collection of photographs he took around town in 1998 to depict what Manitowish Waters looked like in the year of Wisconsin’s sesquasentenial ( that’s the 150 year anniversary of WI’s statehood). The album is huge.. and quite impressive. Mark’s roots in Manitowish Waters go back many generations on both Manitowish and Rest Lake. Mark loves to research but his passion is cartography. He has done some breakthough work on rare defining maps of our area. Some of them are framed and on display at the library. He has also shared many family photos of historical significance to Manitowish Waters. His excitement about local history is contagious and his contributions to our historical society are greatly appreciated. Henry Voss, Ruth’s Grandfather, started collecting photos and documenting the history of the area in the early 1900s. The tradition was continued by Ruth and her mother Audrey Voss Dickerson all through the twentieth century. Many historical photos and stories can be found in Ruth’s published book “Lunch at Boney’s Mound”. Ruthie serves as a Director of the MWHS and has very generously shared much of her collection with the historical society for our archives and website. Her stories, book, videos and photos about the history of Manitowish Waters continue to delight both residents and visitors and she is still adding to her collection. Through Ruthie’s efforts, in 2017 the Wisconsin Historical Society has added Voss’ Birchwood Lodge to the State Register of Historic Places. We recognize Ruthie as our own local “treasure”. The Dunn family have been summer residents for many decades and the two brothers have always been active contributors to the town’s preservation of history. Michael is recognized for documenting the first published history of Manitowish Waters and for his extensive research regarding the “waters of the Manitowish”. His collection of logging and railroad activity in the area has been generously shared with the MW Historical Society and can be found on the MWHS website. The Chamber of Commerce brochures featured Michael’s history of Manitowish Waters for many years and he is very much appreciated for his contributions to bringing our history to life. David has contributed details and his personal recollection of the historic fish elevator previously located at the dam between Rest and Vance lakes. He has donated some very historic maps, artifacts and continues to assist the Society in developing our collection. David is an active member of the MW Historical Society and we appreciate his interest in helping preserve the area history.